The Thresher believes that Cheer Battle does still represent who we are at Rice and is integral to the goals of O-Week. Cheer Battle provides an opportunity for new students to foster college and university spirit in a lighthearted atmosphere; many students find this experience valuable to their growth during O-Week. Hutchinson said many students indicated on O-Week exit surveys that Cheer Battle was their least favorite part of O-Week. Hutchinson has used this fact, combined with feedback from a focus group comprised of college masters and discussion with staff, to support his decision to eliminate Cheer Battle as an officially sanctioned event. However, Hutchinson has not solicited feedback from the general student body. Hutchinson unilaterally decided to remove the university-sanctioned time allotted for Cheer Battle. Arguably, this offense is graver than the decision itself. Cheer Battle belongs as much, or even more so, to the students as it does to the administration. This decision is not solely the administration’s to make; it should be made only after allowing students the opportunity to hear the proposal and provide feedback. This could have been accomplished through first introducing the changes during a Student Association meeting. 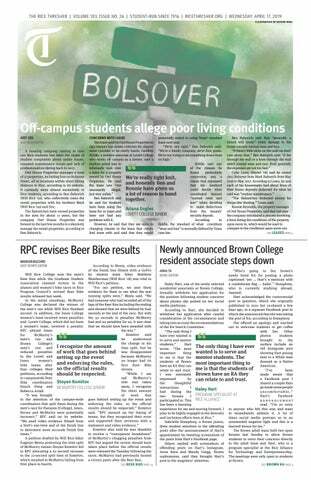 Student governance — Rice prides itself on its faith in this system. O-Week coordinating, just as much as Student Association, Honor Council and University Court, is part of Rice’s system of student governance. Furthermore, Hutchinson’s decision to bypass the Student Association also shows a lack of respect for student self-governance from the administration. Thus, Hutchinson’s decision and method of information dissemination both directly undermine a system that we value dearly. There is room for compromise in the debate over Cheer Battle that Hutchinson ignores with his decision. Profane cheers do not need to be taught during O-Week, and even more resources can be dedicated to providing alternative experiences for students who do not wish to participate in Cheer Battle. Such possibilities could have been considered had Hutchinson not made a unilateral decision and had solicited student opinion instead.